Mr. Esposito is the former Deputy Director, Federal Bureau of Investigation and former Member, President’s Commission on Integrity and Efficiency (PCIE). He holds extensive experience in corporate due diligence, compliance and anti-corruption programs, and safety and security matters in the government and banking industry. Prior to joining Powhatan Group, Esposito co-founded Freeh Group International Solutions (FGIS), an independent global risk management firm specializing in investigations and due diligence, business integrity and compliance, and safety and security. Esposito also served as former Director of Corporate Security, Director of Facilities, and Director of Human Resources and Education for MBNA Bank. During his tenure with MBNA, Esposito was a member of MBNA’s Management Committee where he maintained oversight for all Administrative Services. 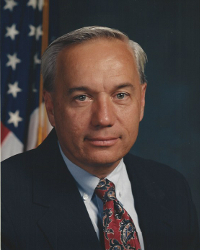 Esposito began his career with the Federal Bureau of Investigation (FBI), and held various management positions within the agency over his 33 year tenure, including Special Agent in charge of the San Diego field office and Assistant Director in Charge of the Criminal Investigative Division. Esposito retired as the Deputy Director, managing the day-to-day operations of the FBI, reporting directly to the Director of the FBI and the Attorney General of the United States.